What are the main qualities of an attractive city — one that draws global talent, investment and ensures sustainable growth? For starters, it is one that offers economic opportunity to a wide range of inhabitants and good places for them to live and play. It needs a well-developed infrastructure — from mass transit to transportation hubs that connect its people and its products to other cities in its country, region and around the world. It also requires high-quality primary and secondary education and universities that help students make positive, long-lasting contributions to their local economy. It boasts a thriving cultural scene and retains its unique cultural heritage while having an open mind to attract international culture. It strives for sustainability and to provide an environment that is green. And while it does its best for its inhabitants, it also strives to attract tourists. Instead, these challengers have charted a new course after political instability or economic turmoil that compromised their physical and economic well being. Others are cities springing up out of what were farmlands or wilderness less than a generation ago. Companies and workers are taking notice — and evaluating new possibilities. Vienna tops the global rankings for the 10th year running, followed closely by Zurich. Auckland, Munich and Vancouver tied for third place; Vancouver has been the highest-ranking city in North America for the last 10 years. Singapore, Montevideo and Port Louis repeated as the highest-ranking cities in Asia, South America and Africa, respectively. 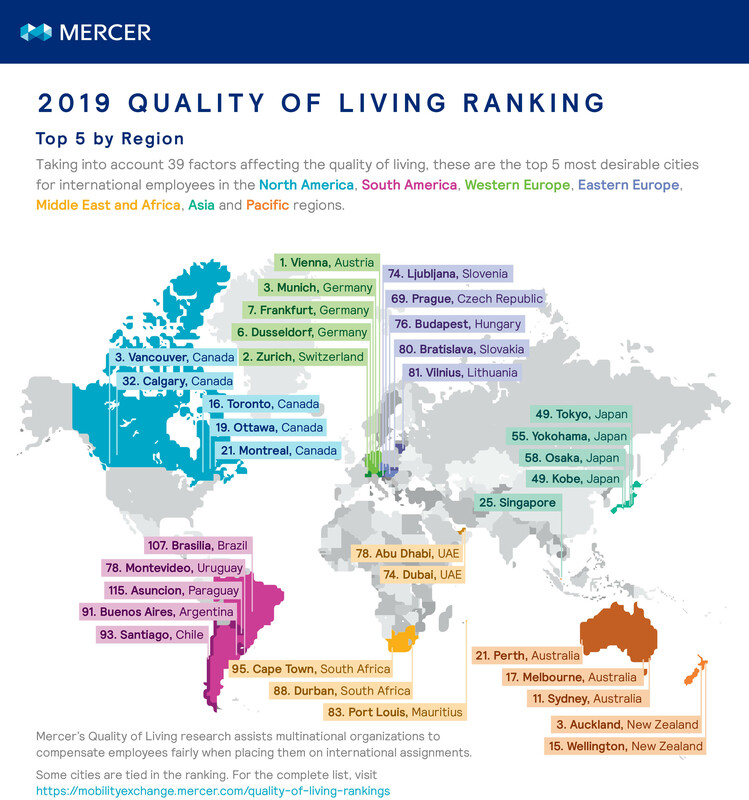 But roughly an hour’s drive from Vienna is Bratislava, which saw a 19 percent jump in its quality of living since 1998, when Mercer began its Quality of Living surveys. Zurich must compete against not only other well-ranked Swiss cities like Basel and Geneva but against rising metropolises in eastern and central Europe — and even smaller challenger cities beyond. Indeed, Mercer’s Quality of Living survey has witnessed significant change. As noted last year, during the survey’s 20th anniversary, many cities have made enormous gains in quality of living in the course of two decades. After the cessation of hostilities in the former Yugoslavia, Sarajevo saw a 21.5 percent increase in its QOL; Belgrade experienced an 18.3 percent uptick; and Zagreb’s QOL rose 15 percent. 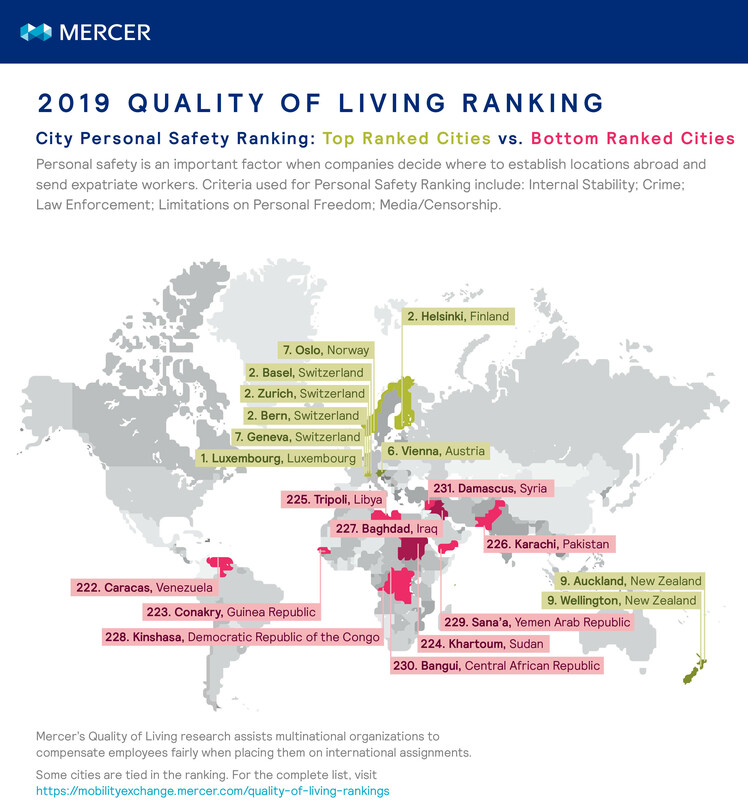 Cities are also ranked according to personal safety, which is the cornerstone of stability in any city, and without which, no business or talented workforce can thrive. This metric analyzes cities’ internal stability, crime and law enforcement, as well as limitations on personal freedom and the freedom of the press. This year, western Europe dominates the rankings, with Luxembourg named as the safest city in the world, followed by Basel, Bern, Helsinki and Zurich in a four-way tie for second. Moscow and St. Petersburg were Europe’s least-safe cities this year, while Damascus is the least-safe city, both in the Middle East and the world. 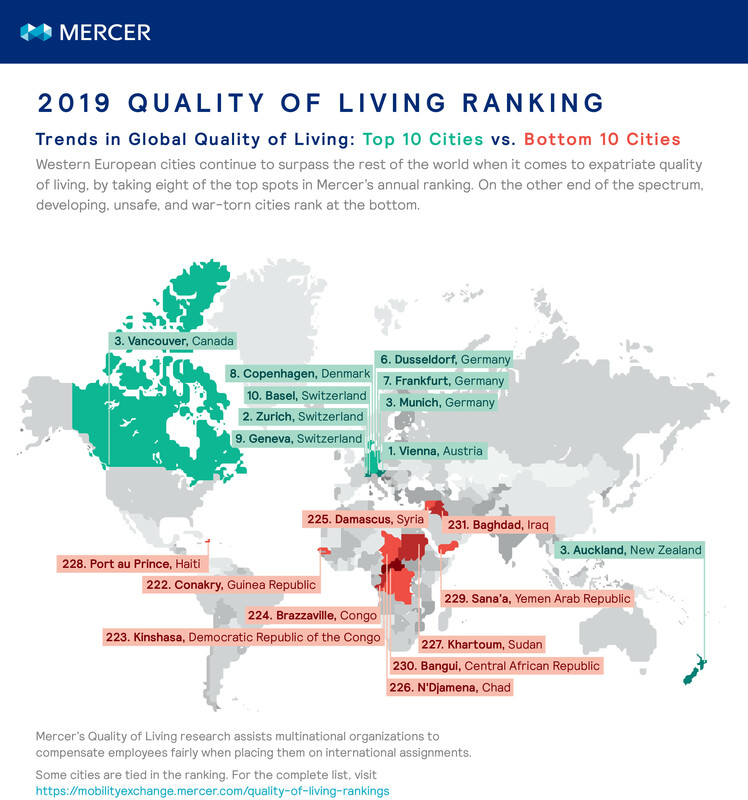 Mercer is now working on a city attractiveness index that will, by assessing more than 150 metrics, enable cities to better understand key performance indicators — both their own and those of other cities. The index will cover well-established measurements of attractiveness like the quality of a city’s housing stock, as well as the ground rules for the future of work. Cities now must be prepared to talk about how green they are and the age and gender diversity in their workplaces. 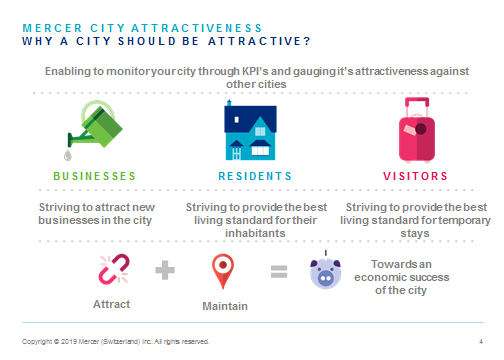 The KPIs in this new index should help cities provide the best possible living standards for their current inhabitants as they work to attract visitors and new businesses. In an age of increasing globalization, better visibility into their attractiveness can help them to better assure their long-term economic success. With a clear view of their strengths, cities are now working to attract tourists, companies and mobile global talent. They seek to create a unique identity for their city in the minds of citizens, visitors, companies and investors by leveraging their quality of living ranking into a KPI for a wider audience. Dubai used Mercer QOL metrics as one of its KPIs in its Dubai Plan 2021. Singapore uses its KPIs to communicate that it is possible to be both a high-density city and a highly livable one. Its challenge wasn’t just one of density. As Khoo Teng Chye, the executive director of Singapore’s Centre for Liveable Cities, noted in an interview last year, Singapore is an island of scarce resources and a small market compared to the countries around it. Its ethnic and cultural diversity, he added, means that Singapore must constantly strive for social integration. To meet those challenges, Singapore focused on three things. The first was to make sure that every resident had an adequate home, and the second was developing a sewage and waste infrastructure to maintain a clean city. By 2050, more than 68 percent of the global population is projected to live in cities, according to the 2018 United Nations World Urbanization Prospect survey. This means that cities must be able to deliver the attributes most sought by companies and employees — from quality housing to infrastructure, education and jobs. Ultimately, globalization has made it more necessary than ever for city officials to have a clear understanding of how well they are doing to realize these goals, now and for the future. By paying attention to their KPIs and measuring their improvement against them, they can demonstrate a commitment to quality of living that goes well beyond their borders. This article first appeared on BRINK and was republished with permission.